Manchester United are currently preparing to offer Timothy Fosu-Mensah a new contract, after the player impressed Mourinho this season. Reports from England claim that United are in the process of preparing a new deal for the 18-year-old, with only a few minor bugs left to be ironed out. The defender is thought to have already impressed manager Jose Mourinho, and looks set to have a long-term stay at Old Trafford. 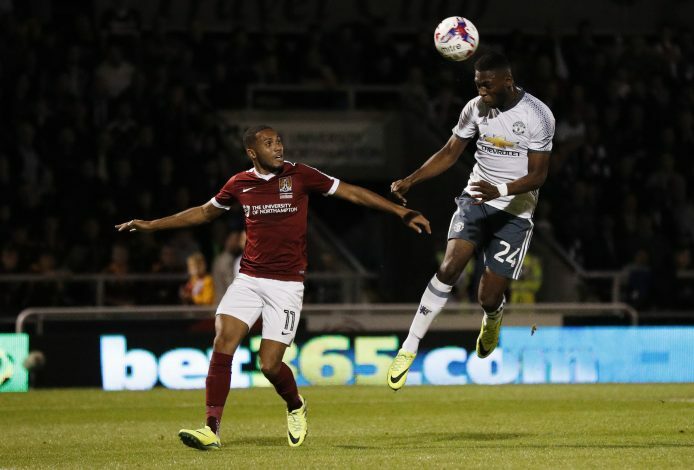 Fosu-Mensah has the strength and technical ability to become an Old Trafford great, with fans already comparing him with the likes of Gary and Phil Neville. Contract talks were believed to have been initiated last summer, and it now seems that the youngster will pen a new deal during the weekend. The new contract is expected to be 4 or 5 years long, while a salary upgrade is almost certain. Fosu-Mensah broke onto the scenes earlier this year, under Dutch manager Louis Van Gaal. He has played in all sorts of positions, ranging from left-back to central midfield. “It’s going well,” Fosu-Mensah said recently. “I have not played much, but train with the first-team and do everything with the first-team. I want to fight myself in there. Jose Mourinho sent a number of youngsters out of the club this summer, but Fosu-Mensah managed to keep himself in Mourinho’s first-team squad. The Dutch youngster made 8 first-team appearances last season, and 2 this season, although he is yet to start in a League match. He joined Manchester United’s Youth Academy in 2014, after beginning his football journey with Ajax.